I’m so mad I saw this after I got my braids!!!! The Good hair blog has a protective style challenge running currently and the host of the challenge came up with marley twists as a style option. The reason I’m so excited about this style is that not only does it use extensions that look like natural hair, but that we can find the extensions locally! 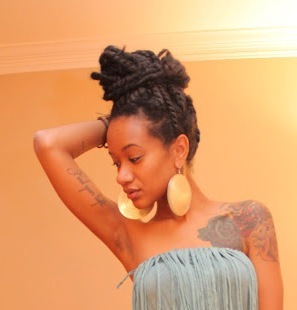 She used what we call hard dread extensions. She basically stretched the dread out a little with her fingers then used it to make a twist. Easy! I think I may be able to do this on my own. It is definitely on my hair to do list! Check out the tutorial video below and follow this link for more info. Shout out to Neno Natural for the link. Absolutely love the look of marley braids!! I’ve seen different styles from updos to braids using this extension all over youtube and blogs. Where in Gabs can we get them? coming home soon and I don’t want the heat to fry my strands. I adore them too and can’t wait to try them! The extensions are widely available here, any store specializing in hair extensions will have them. They are not exactly like the American type but they are really similar. I have used them before but for a different style. I’m confident they would do the job. DO YOU MEAN THE DREADS FOR HARD DREAD ARE THOSE USABLE?? Yes they are, watch the video to see how she does them.